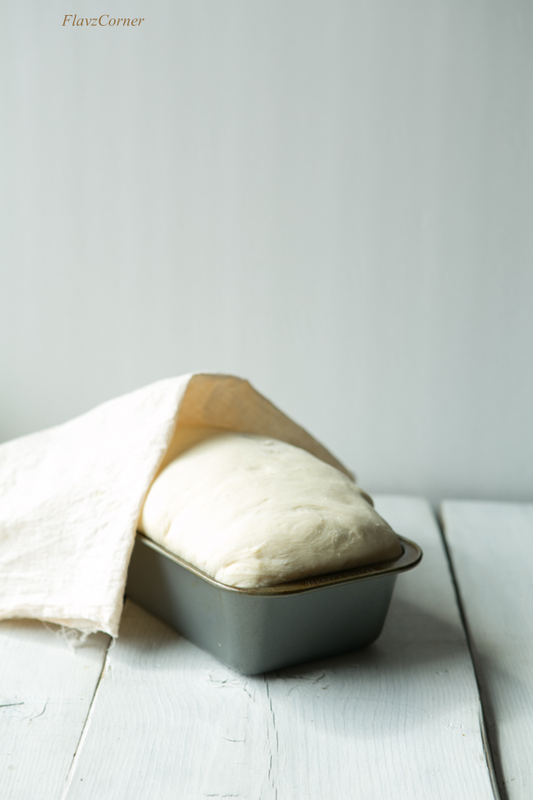 A well fermented batter or well proofed bread dough is the simple joy that thrills me. I feel that the exertion of cooking and patience is rewarded at those special moments. Seriously the joy is unexplainable; you have to experience it yourself. It means a lot when you are living in a place where more than half of the year is cold. You will find all the means to ferment an idli batter. The furnace vent in our old house was a great alleviation for me to get the perfectly fermented batter. But few mishaps had happened which surely ticked off my hubby where the overly fermented batter got out of the bowl and fell through the vent into the furnace. That was really a nightmare to clean up all the crusted batter inside the furnace. Luckily it didn't break the furnace. Later on I used to take precaution by placing the batter bowl in another big container to avoid the spill into the furnace. Now I rely on my oven for fermentation. It works and few spillages have occurred too. But I always get thrilled to see the perfectly fermented batter or well proofed dough. My kids ask me ‘Why you are so happy Mommy?’ I am not sure if I could convey it to them till they start cooking their own. You know what I mean :). Several trials of perfect whole wheat sandwich bread have failed in my kitchen due to many reasons. The honey oats bread was a great success. But my quest to find the perfect recipe for plain sandwich bread kept going on. Finally I decided to try a white bread first and see the results, so that I can improvise it and develop a whole wheat sandwich bread recipe. It’s been ages I had used white bread, but I had to give it a try to get a step closer to the recipe for the wheat bread. I was over cloud 9 now when I sliced the first piece out of the White bread I made. It was soft and firm enough to cut through each slices just like the store bought sandwich bread, I would say even better than the store bought bread because there are no preservatives in this bread and it’s freshly made and it tasted delicious. It was an instant hit. My home smelled like a bakery. Kids approved both the texture and the taste of this bread and it was all gone within 2 days. They enjoyed it for their weekday breakfast with homemade mixed berry jam. In a bowl, mix 1/4 cup luke warm water, yeast and 1 tsp. sugar. Keep it aside for 10 minutes or more in a warm place to activate the yeast. The mix should be frothy. In a mixing bowl of a stand mixer, combine the flour, sugar, luke warm milk, yeast mixture, salt and honey. Attach the dough hook and knead for 5 minutes. The dough will be very sticky and loose. Now add the melted butter and knead for another minutes. Scrape the sticky dough in to a greased bowl or you can leave it in the mixing bowl. You shouldn't be able to make a ball and it will be sticky. But that's how we want it to be. Cover and keep it in a warm place for the dough to proof or till it gets double or triple the size. I kept mine for 1 hour and came all the way up to the rim of my mixing bowl. Alternately you can knead the dough using greased hand to form and sticky dough. Grease a standard loaf pan. Transfer the proofed dough into a generously floured surface. Punch down the air bubbles. Use 2 to 3 tbsp. of the four to knead the dough for 30 seconds so that they are not sticky, but still very elastic and loose. Using your hands stretch the dough into a rectangle. Roll the longer side to the other to form a log and pinch the sides. Place the rolled log shaped dough into the greased pan with seem side down. Cover with a kitchen towel and keep in warm place for 30 to 40 minutes for the dough to proof the second time. This time the dough should rise above the rims of the loaf pan. If it is not risen enough, keep it for another 20 minutes. Brush the top of the proofed dough with milk. Bake the bread in the middle rack of the oven for 35 to 40 minutes. The top of the bread should be golden brown and it will be in dome shape. Let the bread sit in the pan for 20 minutes. After 20 minutes transfer the bread to a wire rack to cool completely. Slice them and enjoy as you like. The dough should be very loose. While kneading the dough will be very sticky. The sticky and lose the dough is the softer the bread will be. So don't try to add more flour than what is needed. The extra flour should be added only during the time when the dough is shaped to log. Brushing the top of the bread with milk/melted butter gives the bread the nice color. 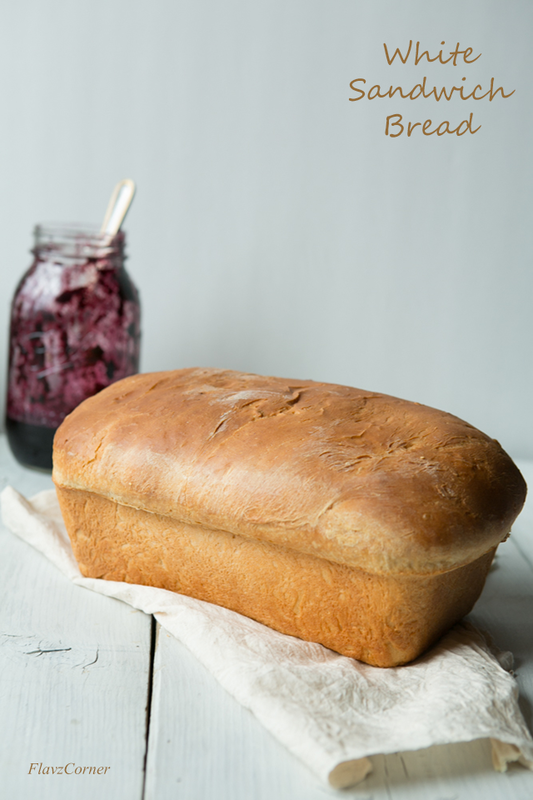 This bread is similar to the white sandwich bread and you can use it for sandwiches, French toast or simply toast it and enjoy with your favorite fruit preserve. 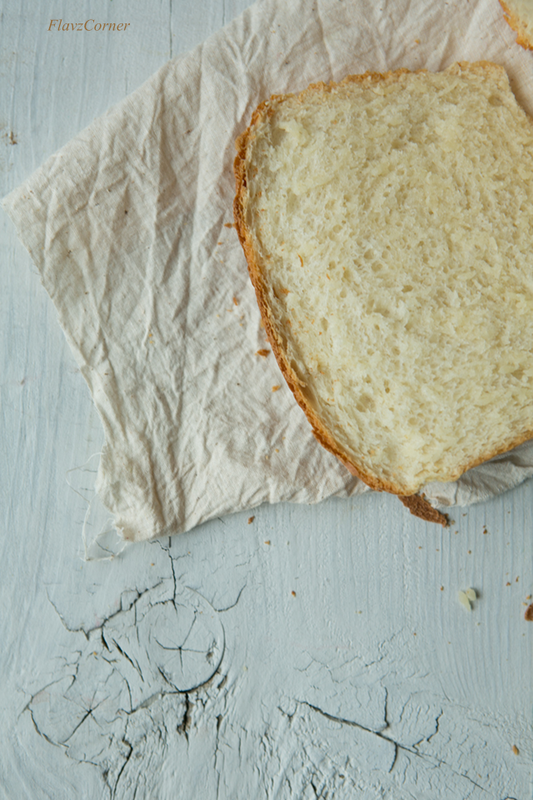 Wrap the bread with aluminum foil and you can keep it outside if it is not too humid for 2 to 3 days. Otherwise wrap and store in the refrigerator for a week. 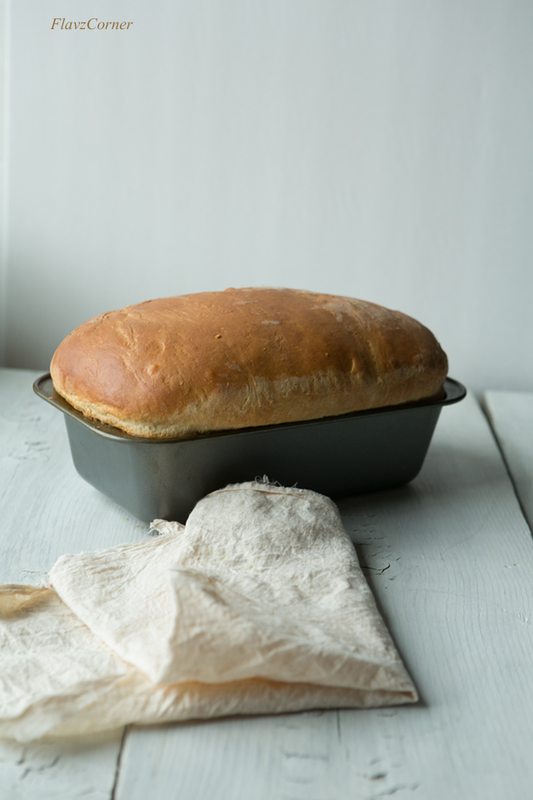 The key to a soft bread is that it should have enough moisture and fat to get the right texture without over drying. The milk and the butter surely worked out in this recipe. You can increase the amount of sugar to make it as a sweet milk bread like Wonder bread. What a gorgeous loaf! I totally love that golden crust and soft smooth crumb. Great one, Shibi. Thanks Angie for your consistent support with lovely comments!! Thanks Anu!! Do give a try and let me know how it turns out for you. Yes Remya, the freshly baked loaf of bread right from the oven tastes delicious and you won't like to buy anymore. Homemade bread is the best! We (well, Mrs KR!) bake at least once a week, often more. 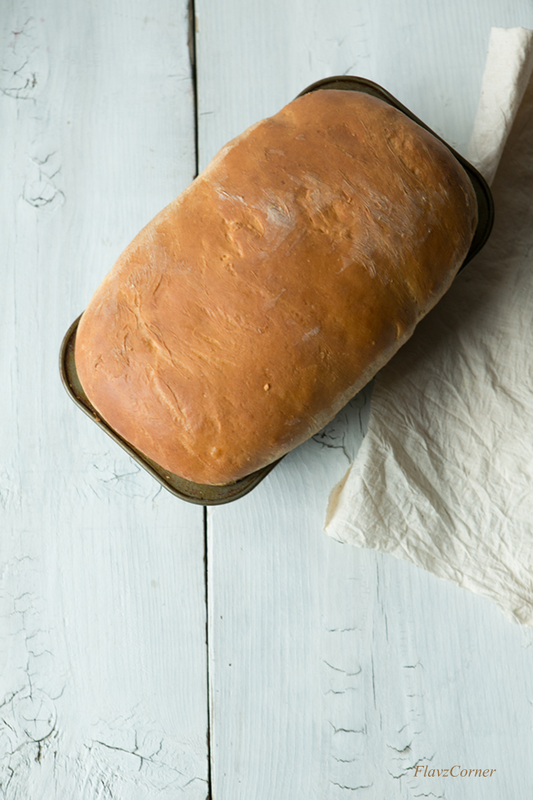 This is a great recipe for a nice, soft loaf that won't go stale too quickly. Good stuff! Thanks. I used to buy the weekly quota of bread, but now its more convenient that I could make it whenever I want and don't have to compromise on the taste either. The simplest and yummiest thing ever! Sorry about missing so many of ur posts and thank you for being so prompt in visiting mine Shibi. My blogger doesnot load well so visiting blogs is getting limited. Beautiful fluffy moist bread.Love it.